Our research-based and clinically proven partner programs give teachers a strong framework for bringing yoga to underserved communities. Find a yoga therapy training in your area, and learn how you can foster positive body image, help at-risk youth and adults build a better life, support veterans’ recovery from PTSD and more. Take your practice out into the world. Join a global community of proactive leaders and explore the 8-limbed path of classical yoga with The Hard & The Soft Yoga Institute, a Yoga Alliance-registered school that has trained yoga teachers since 1980. Its unique, comprehensive 200-hour and 300-hour trainings will both prepare you to practice and share the powerful therapeutic tools of asana, meditation, conscious breathing and mindfulness – and pave the way for a career in yoga service, helping you to participate in healing the world and our planet. Explore the three principals that shape these trainings: yoga therapy, yoga service and personal practice. Foster positive body image through yoga and community. Eat Breathe Thrive offers a system of support for anyone struggling with negative body image and disordered eating. Its clinical program, Yoga for Eating Disorders, gives clients in treatment centers yoga-based tools for long-term recovery; while its community-based “Thrive Tribes,” led by certified facilitators, provide an intimate network of ongoing support. Learn how you can help the program to grow, and bring Eat Breathe Thrive to your community or clients. A $5,000 Donation will bring Eat Breathe Thrive’s clinical program, Yoga for Eating Disorders, to a treatment center. Yoga for veterans: help returning warriors to find a calm body-mind. Mindful Yoga Therapy is a pioneer in the field of yoga therapy programs as a complementary treatment for veterans with PTSD, offering clinically-proven protocol that is in use at 48 different VA facilities nationwide. 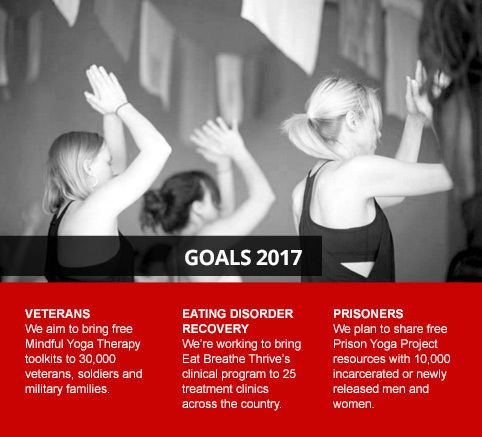 Learn how you can help to share free yoga resources with veterans, and how you can bring Mindful Yoga Therapy into your own community. A $3,500 donation will fund a full scholarship for a veteran to become certified as a yoga teacher. Give men and women behind bars a chance to heal and transform. 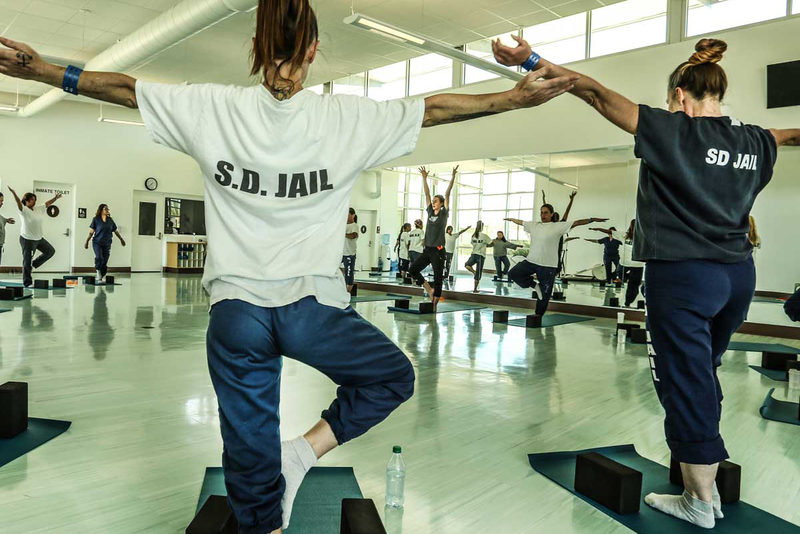 Through a program of trauma-informed yoga that’s taught as a mindfulness practice, the Prison Yoga Project helps incarcerated men and women to heal from unresolved trauma and learn skills for non-violent problem resolution. 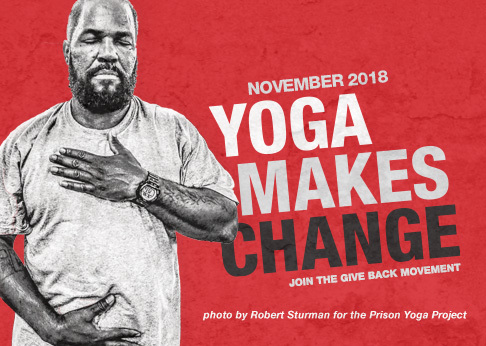 Learn how you can help to bring free yoga resources to prisoners, and how you can share the program in your own community. A $3,500 donation will fund a full scholarship for a former prisoner to become certified as a yoga teacher. Support addiction recovery and relapse prevention through yoga. By integrating the wisdom of yoga with the practical tools of 12-step programs, the Yoga of 12-Step Recovery (Y12SR) offers a rich and powerful framework to support addiction recovery. Learn how you can help to bring Y12SR into your own community and to under-resourced treatment centers, offering a proven tool for relapse prevention. A $2,500 donation will fund a year’s worth of weekly Y12SR meetings at an under-resourced treatment center. Share yoga with cancer survivors to help manage the challenges of treatment. Founded to help cancer survivors find well-being, yoga4cancer integrates yoga into cancer treatment plans. Managing side effects, boosting immunity and improving recovery, yoga also provides a supportive environment for those touched by cancer. Learn how you can help the program grow and support more yoga teachers to bring this practice to communities nationwide. By submitting I agree to the terms & conditions. Give by check or find other ways to donate.